When it comes to sim gamers, nothing is too expensive or too out of the ordinary. They will pay any price to have an experience that is as close to the real thing as possible. Meet the VRX iMotion. Nvidia was showing this bad boy off at their booth at CES this year, so I just had to give it a whirl. 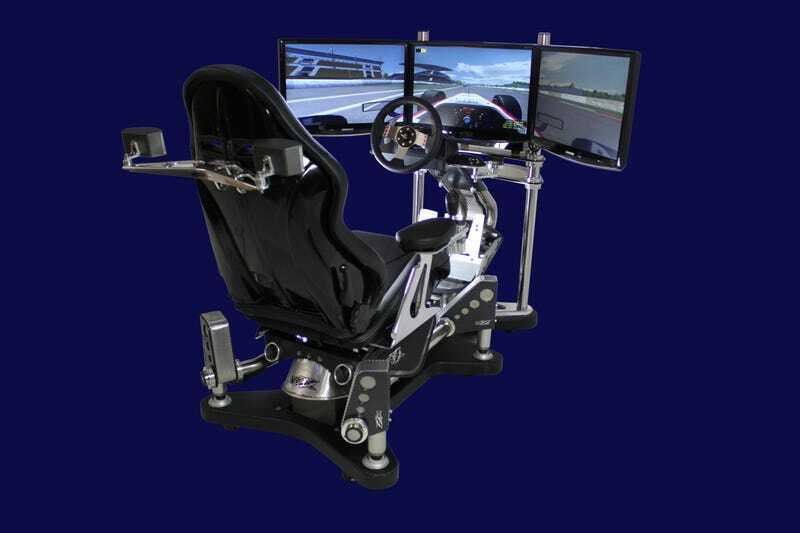 VRX told me that for around $32,000 you get the chair, actuators, screens and a badass PC. As Billy Mays would say, "It comes with everything you see here!" They will ship it to your house fully assembled in what I'm assuming is a giant wooden crate that will require a crowbar to open. If you throw in another $1500, VRX will provide you with three 42" 3D monitors and 3DVision 2 glasses courtesy of their partners at Nvidia. How nice of them. Did I mention it also comes with surround sound speakers? Of course it does. The iMotion currently supports games like iRacing, F1 2011, DiRT 3 and even Battlefield 2. I did about 20 laps on iRacing and it was rather intense. So, if you're rich and curious, you can start a private conversation with VRX by emailing them via their website. For that kind of money, hopefully you can have half as much fun as this guy!